COSTA MESA, CA--(Marketwired - June 24, 2015) - Ecliptek Corporation, recognizing its customers need to comply with the European Union's REACH June 15th, 2015 addition of two new Substances of Very High Concern (SVHC) to the candidate list, has introduced five new miniature oscillator series that adhere to the new substance requirements. Housed in a 2.5mm x 3.2mm 4 pad ceramic SMD package, these oscillators deliver frequency options between 16.000MHz and 50.000MHz while offering five different supply voltage choices. 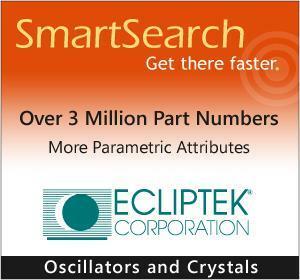 Part number specific information for these new series has been integrated into Ecliptek's automated website tools, including the SmartSearch and Quick Quote apps. Ecliptek's advanced self-service documentation tools provide easy access to Data Sheets, REACH, RoHS, China RoHS, IPC-1752 Material Declarations, Qualification and Reliability Reports, and Conflict Mineral documentation on over 3 million verified Ecliptek part numbers. The 2.5mm x 3.2mm EQRB quartz based oscillator series can be used in a multitude of circuit applications, including clock recovery, phase-locked loops (PLL's), frequency modulation/demodulation and digital switching where board space is limited. SmartSearch is an efficient tool to define your configuration and find the part number you need in less than 60 seconds.